Bring out the best in your property with our carpet installation services. When you work with our professional carpet installer you are taking the first steps necessary to revitalize your home or business. Friendly and affordable, our team knows what it takes to bring out the best qualities in your property with new carpet flooring. There is little stress and plenty of reward when you choose a professional to install your new carpet. Our team makes sure your carpet is properly installed with no unseemly mistakes. Your warranty may depend on the carpet being installed the right way! Installing a new carpet is a very challenging job that can cause an amateur to give up or actually end up overspending to fix mistakes. 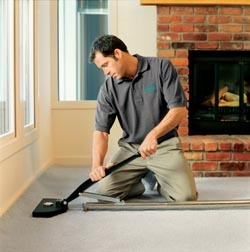 There are a variety of different skills and techniques required to install a carpet correctly, including the ability to use difficult equipment such as the knee-kicker, seam roller, and carpet stretcher. An inexperienced carpet installer’s lack of knowledge can end up causing a homeowner all sorts of issues, including lifting carpets, ripples, and seams that show, as well as invalidated warranties, extended construction times, and higher expenses. Want to avoid these hassles? Then you need to work with a professional for your new carpet service. We help you avoid the troublesome issues mentioned above while providing you with the quality, on-time work you deserve. Your home or business is one of the biggest investments in your life and when it comes to flooring, you should make sure it isn’t in the hands of an amateur. Looking to install a new carpet to a single room? Want to re-carpet your entire property? No job is too small or too big for our trained carpet installers. We take on jobs of all sizes and ensure that you are 100% satisfied with the outcome when we are finished. Don’t think that professional carpet services are out of your budget when our team can provide you with the affordable services you need to transform your property. Any type of construction or remodeling job comes with a certain amount of risk, but if an amateur makes a mistake you might end up eating the extra costs it takes to fix it. This isn’t the case when you work with a professional, however. Not only are mistakes less likely when you work with our trained team of carpet installers, but if something does come up we will fix it no questions asked. You deserve to enjoy your new carpet and our team does everything it takes to make sure that happens. Contact us for the carpet installation service you need for your residential or commercial property. Our team is proud to assist customers living throughout Plaistow, Atkinson, Hampstead, Kingston, Danville, Newton, Salem, and Windham in New Hampshire as well as Haverhill in Massachusetts.